Information technology innovations involve a constant evolution of man-machine interaction modes. Automated authentication of people could be used to better adapt the machine to the user. Security can also be enhanced through a better people authentication. Biometrics appears as a promising tool in these two situations. Different modalities can be envisaged, such as: fingerprint, human face images, hand shape, voice, handwritten signature... In order to take advantage of the particularities of each modality, and to improve the performance of a person authentication system, multimodality can be applied. This motivated the recording of BIOMET, a biometric database with five different modalities, including face, voice, fingerprint, hand and signature data. 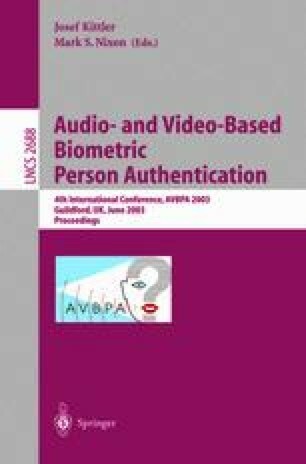 In this paper, the BIOMET multimodal database for person authentication is described. Details about the acquisition protocols of each modality are given. Preliminary monomodal verification results, obtained on a subcorpus of the BIOMET fingerprint data, are also presented.